4549 Eriobotrya japonica - Loquat Champagne, grafted ? Loquat, Japanese Plum. Medium to large white fleshes fruit. Fruits are excellent quality - melting and very juicy. 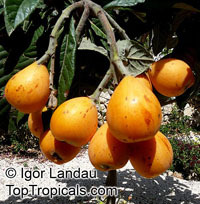 Loquat is very hardy fruit tree, easy to grow, drought tolerant, fast growing.